There’s a running joke with our family. When someone is out of town (usually me) or at some kind of event (usually the kids), the rest of us go out for sushi for dinner. The key to a successful sushi venture is the photographing and bragging about it to whomever was not in attendance. But if you’ve ever ordered sushi at a restaurant or even looked at the prices, you realize that it can be an expensive meal. 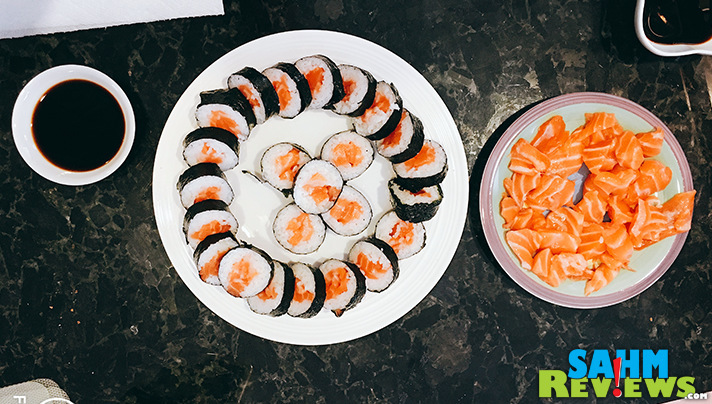 Because we were ordering SO much and SO often, we decided to learn to make sushi at home. 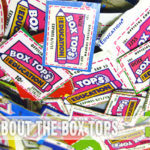 Not only is it more cost effective, but it also provides a great bonding experience. We’ve invited others over to join us for this delicious meal and realized we just need to plan a party around it! Who knew it could be as easy as two steps?! You can order a platter of sushi from a local restaurant, but that can get pretty expensive! The key to making sushi at home is to purchase the proper ingredients and tools. We’ve outlined 7 tools and ingredients that make the process easier. Of course, not everyone is a fan of fish but that doesn’t mean they cannot enjoy sushi as well. 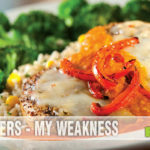 Offer varieties that include cucumbers and avocados, cream cheese or even cooked beef. 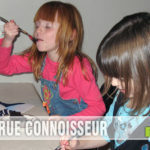 As an alternative, use our recipes to make corndog sushi that even the pickiest eater will enjoy! 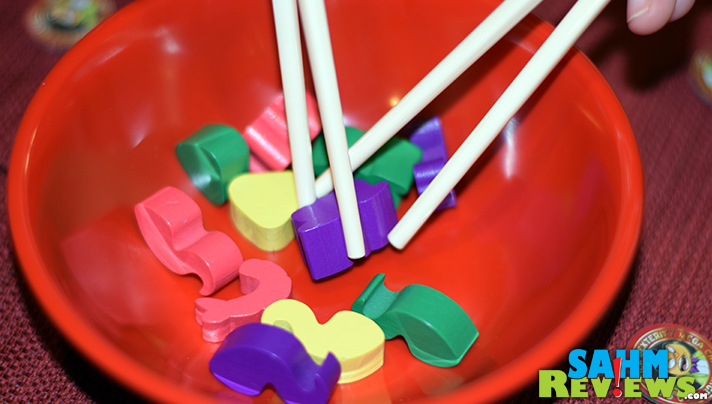 Chopstick Dexterity by Mayday Games: If you’re handy with chopsticks, you’ll have the upper hand! Players simultaneously fight to fish out (get it, fish… sushi…) the right wooden pieces from the shared bowl. The concept of the game is simple, the difficulty comes in the handling of the sticks. Perfect for people wanting to hone their skills. This dexterity game is for 1-3 players and plays extremely fast with games lasting less than 15 minutes. 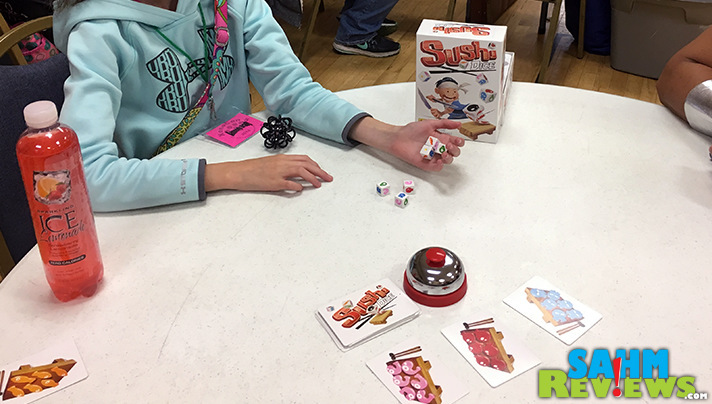 Sushi Dice by Dude Games: Just like in a restaurant, you want to work fast but efficiently. This dice game blends those concepts as you vie to be the first player to fill the order. Perfect for beginners, games only last about 15 minutes and accommodates 2-6 people. Sushi Draft by Blue Orange Games: Randomly draft plates of sushi and collect points and hope for the most diverse menu when all is said and done. The person with the most points after three rounds is the winner. Works for 3-5 players and done in 15 minutes. 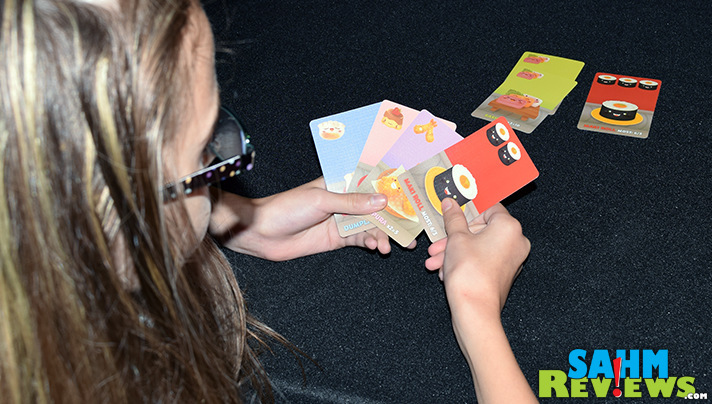 Sushi Go Party by Gamewright: Like its predecessor, pass cards and and work to achieve the most points. A board with additional “a la carte” items and scoring pawns, this version was designed to improve on some of the problems people had with the first version… primarily to accommodate more people! Supports 2-8 players and takes about 20 minutes. Tem Purr A by iello: Moral of the story… Don’t eat too much. A perfect game for such an event! Devour as much as possible in this eating contest without losing your lunch. Supports 3-7 players; quick play card game. 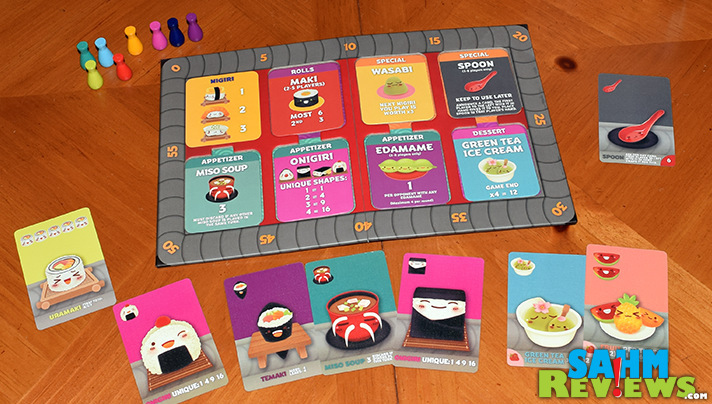 Wasabi by Z-Man Games: Randomly draw ingredients into your hand then add them to board alternating with the other players in an attempt to be the last person to complete and claim recipes. It’s a light game, fast paced and for 2-4 players. Time can range from 30 to 45 minutes. 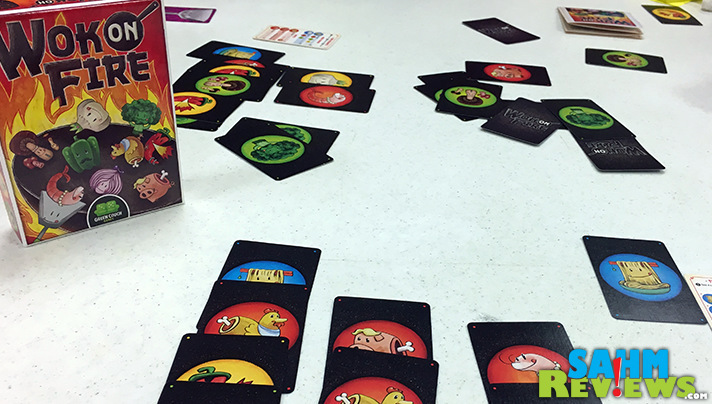 Wok on Fire by Green Couch Games: If you’ve ever used a card to flip over another card, then you have what it takes to master this game. Flip cards, grab ingredients, create recipes and total your points. Simple. Up to 4 people can play. Easy enough for young kids but still fun for adults and only takes about 15 minutes. Happy Salmon by North Star Games: It’s a party and salmon is our favorite sushi. I would be remiss if I didn’t mention Happy Salmon. The goal is to be the first person to get rid of all your cards by matching with other players as everyone simultaneously is on the same mission. Quick paced and chaotically fun but requiring no prior gaming experience, this game will have everyone interacting and laughing. Duration per game: less than 5 minutes. 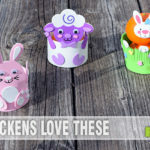 These games offer a variety of styles and experience levels with some being great for beginners and others ideal for seasoned gamers. 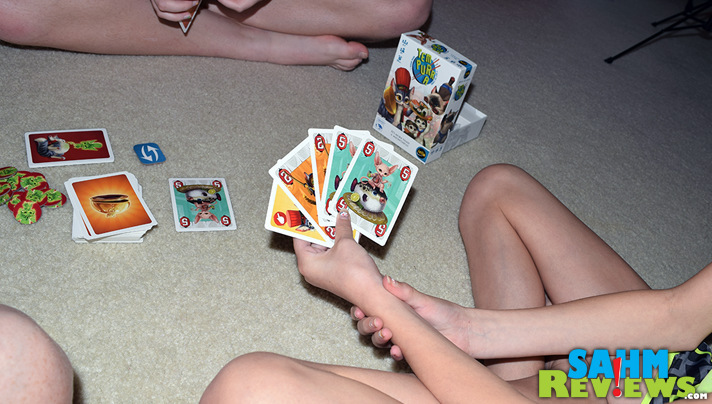 A few are quick-play games while others require a longer sitting. Depending on the number of guests, we recommend having a good mix of short and long games and encourage players to rotate whom they compete against. If you’re curious about any in particular, just ask. We’ve played them all! What type of themes do you usually see at parties you attend? 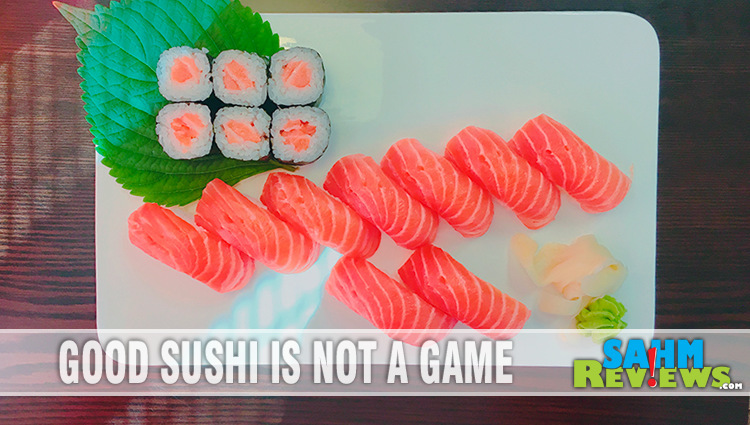 I am not a fan of sushi but light games that non-gamers can easily jump into are great. Indirectly related is a game I would like to check out in person is Salmon Run – you are a fish trying to swim upstream with some light deck building / hand management. Glad to see your family has a running tradition that you all enjoy. We don’t own it, but we have played it! Can’t believe we forgot that one! My son would want the real sushi! He might think the game is cute too though. I have never had real sushi before, but the game looks fun. I wonder if my kids would like it since they are so picky? Picky about sushi, Amy, or about games? 🙂 We have regularly introduced new foods to our kids since they were little and there are few foods they don’t like. I love that they enjoy sushi although it can get expensive. If you’ve never tried it before, you should try it at a sushi restaurant as opposed to another who happens to have sushi on the menu. Let me know if you try it. As for the games… all of them are fun. The chopstick one is hilariously fun. I’ve never tried Sushi before and not really sure I would like it.The game looks like it would be fun to play. 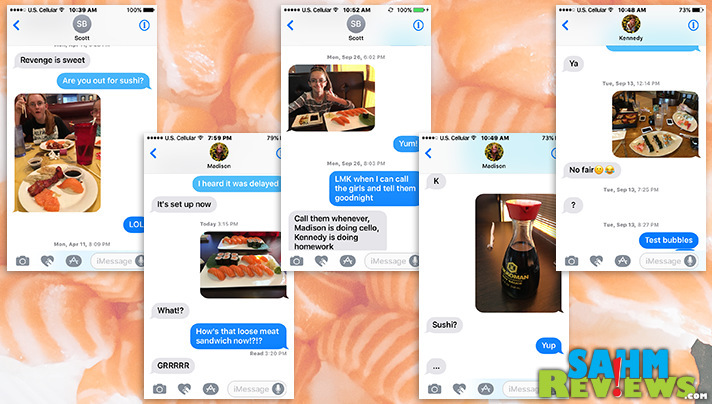 I love this thread, because we are such a sushi-loving family. Going to a sushi boat-style restaurant is our version of fast food (super quick, but not junk food), and we go a couple of times every month! Great ideas for the fam. I really enjoy Sushi Go so I was really excited to get Sushi Go Party because there have been times when we’ve had 5 or 6 people and wanted to play it but couldn’t. Now we can! Games and sushi, two of my favorite things. Love this idea. This game looks so cute! I’d love to play this with my little people! This game sure sounds like a good one to play with my family. Sushi go is totally fun, i’m carving for some sushi right now! I tried sushi once & didn’t care for it. My brother in law loves it though! The game looks fun & it sounds like a fun party idea. Thanks so so much! Great pics. I’m not a fan of sushi, but there a some cute ideas that make candy look like sushi. And I’m into candy and games so…sounds like fun!